We, the Hirsch family are looking forward to your visit. Our apartment, which is located in the center of Schöna, has a size of 45m² and offers 2 people (plus an extra bed) space. The apartment is centrally heated and is equipped with a living room, TV-SAT (digital), a bedroom, a kitchen and shower and toilet. The bathroom was newly renovated in 2016, the living room 2017. For your car a carport is available as a parking space. In our village, a butcher and restaurants for your physical well-being. 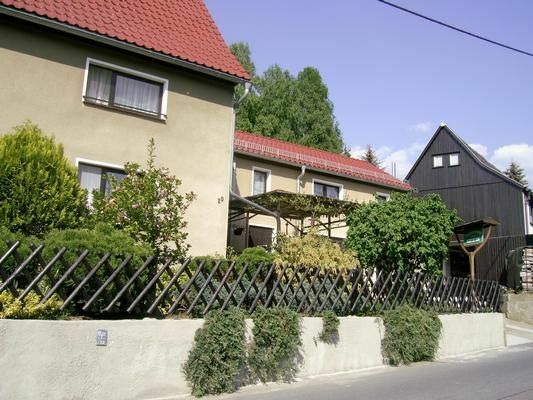 In addition to hikes to the local mountains Kaiserkrone, Zirkelstein as well as the nearby Zschirnsteinen, the area of ​​the Saxon Switzerland offers versatile excursion and hiking possibilities. So you can, for example, the fortress Königstein, the bastion with the rock stage Rathen, the castles Stolpen and Hohnstein visit, or let it go in the Toskana spa in Bad Schandau with a brine bath or in the sauna world really well. Furthermore, you have the opportunity to take a bike ride on the Elbradwanderweg with bicycles. For further leisure activities in the property is a large garden with swing and meadow for games and sports available. - Visitor's tax: per person and day Costs amounting to 1.5 EUR (Mandatory). Sehr netter Kontakt ( der Gastgeber war selber im Urlaub. Vertretung durch Mama unkompliziert und freundlich). Eine schmuse Katze und Gastgeschenk als Begrüßung. Sehr sehr nette Vermieter, welche sehr hilfsbereit sind. Die Wohnung ist sehr schön und ruhig gelegen und hat alles was man braucht! Einfache, kleine und saubere Ausstattung. Am Malerweg ruhig gelegen, fußnah von Zirkelstein und Kaiserkrone, welche es zu besteigen. Lohnt. Sehr nette Gastgeber, welche uns mit Wein und Obst begrüßten. Ganz in der Nähe auch eine Dorfgaststätte mit guter Küche. Internet (per property per day, included 0 EUR). Parking (per property per day, included 0 EUR).